If you love neutrals, you can't go wrong with this palette. These beautiful colors are blendable and flattering on most complexions. They have a Soft silky feel and no fall out. Highly pigmented, a little gets the look you're going for. The shades inside are rosey/warm bronzey tones that just work together beautifully. The palette came in a pretty, girly and elegant package that is nice and slim and doesn't waste much space. It has a magnetic snap to close which feels very secure. It is so nice and compact, and fits nicely into my handbag for travel. There are 4 shades total; 2 matte and 2 shimmer. This shade collection comes in a recyclable, magnetic palette and includes a dual end sponge/brush bamboo applicator which is eco-friendly and cruelty free. Colors: Kashmir (matte brown), Satin Sheets (sparkly gold), PS Pink (matte medium pink), and Angelic (sparkly pale pink). 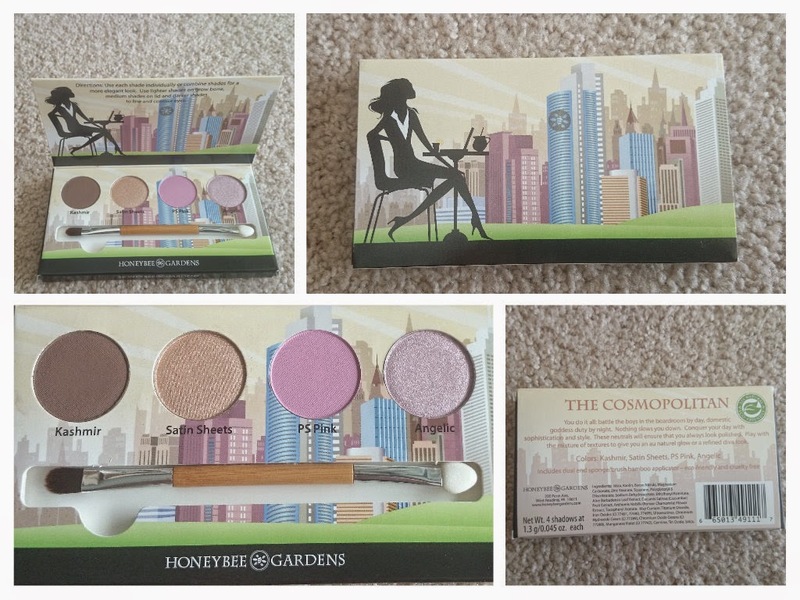 I have fallen in love with this palette and would definitely recommend you to try it out! I'm using this pressed foundation in the shade Supernatural. It matches my skin color perfectly and it does not cake at all. I also like that it doesn't have any of those bad ingredients for your skin as it is Talc free, paraben free, fragrance free and oil free. I have combination skin and I was worried about trying it, but it has turned out to be FABULOUS. Unlike other brands pressed powder, this does not settle into my creases and stays put pretty well, even without primer. Sometimes I do add some tinted moisturizer first, just to add a little extra moisture, but not always. It also doesn't really seem to transfer and stands up to the winter cold and indoor warm temperatures. It lasts throughout the day. I have tried a couple of application methods, but I really like using my blender brush. 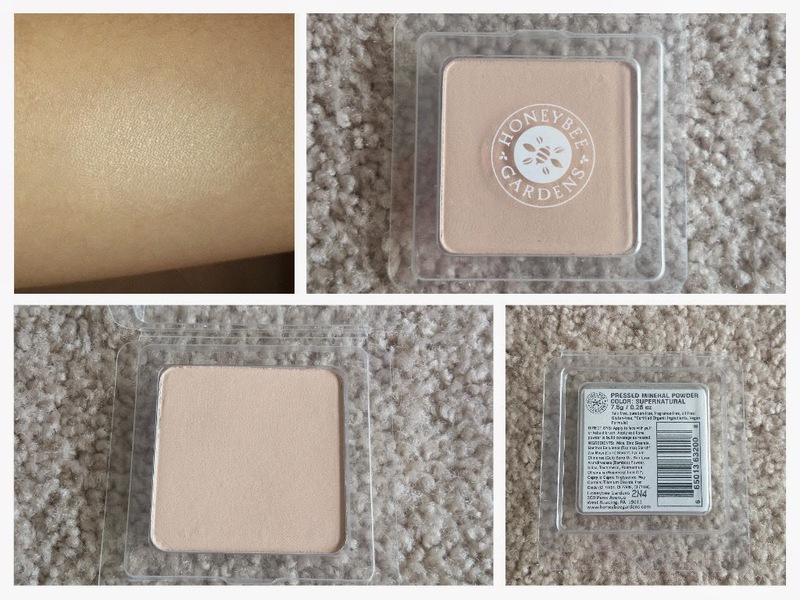 It has a buildable coverage - can be sheer or medium, easy to touch up. It looks very natural. This powder foundation came in a total of 8 different shades. I received these products for a review purpose. Nor was I under any obligation to write a positive review. I give all my thoughts and opinions sincerely. I love these colors, they would look so good on me! While they look great unfortunately I don't wear makeup but my daughter would be more than interested in trying them I'm sure. I took a look at their website and I really would love to try their TRULY NATURAL LIPSTICK. I love facial toner too and I see they have an alcohol free product I would love to try. I think I'd like to try the eye shadows! I have very sensitive eyes, so I gravitate towards things like this that are all natural! I'd be interested in trying all of them. I love the eye shadow. I love the shades on that shadow palette. I've been looking for a great neutrals palette. The eyeshadows! I'd try those or gift to my daughter. So pretty. I never heard of this brand but their products look fantastic! I love the colors here and I love that they're all natural. Definitely checking them out. I love natural colors. I would definitley love to try the pressed mineral palette! The packaging for the eye palette is so cute! I love the colors, too! This is so great to know about! Going to pin to my Beauty board to revisit later! I think the pressed mineral powder is the one product I would be most interested in trying. Those colors are super pretty! I haven't heard of this before but they sound like a quality company! I don't wear much make up but I want to start more! I like that the palette is recyclable. Very cool! These are really wonderful products & these colors are simply beautiful. I would love to try the eye shadows in particular. I love the color palette of the eyeshadow. I also loved the pressed mineral foundation. The eyeshadows look pretty. I'm looking to change up my colors. Whatsblog Fashion Bloggers & Brands Community!